The technological development in Virtual Reality and Augmented Reality is advancing at a pace quite unpredictable. There have been highs and lows throughout the journey, ever since the technology started making sense to the commons. Nevertheless, VR & AR found their way to the most happening topics of discussion in almost every other domain. Social media platforms, particularly, took the crowd by surprise when it hinted to dip into this technology. Recently, digital marketing that focused on social media had a huge influence on the role these media have in the world. Many experts believe that AR and VR will also create the same revolution. Let’s consider, you being at your neighbor’s place. They have recently moved in and have pretty sleek furnishings at home that they have flown in from the States. You take a picture to document the moment. Turns out, you are starting to like the Valence in the picture. So you tap on it, the next thing you know, a note pops up telling you where you can purchase one, how much it costs, and lets you know of any competitive prices online. Before you decide you want it, you bring up the 360 photo of your living room, and insert the valence by the bookcase. It looks great, so you opt to get it by clicking another portion of the screen. Instantly, the item is reserved at the store, you’re sent directions and an automatic reminder is added to your calendar. THAT is thing right there. •Snapchat Lens Studio – Anyone can download Snapchat Lens Studio in order to create lens, filters, and 3D animations. You don’t even need to know how to code, very accessible. •Facebook AR Studio – This program is a little more complex than Snapchat Lens Studio, but still very accessible to new users. Facebook AR Studio has a partnership with Sketchpad to create 3D posts so that you can have a representation of what you are talking about – this application will eventually go into AR so that 3D posting can be mainstream. 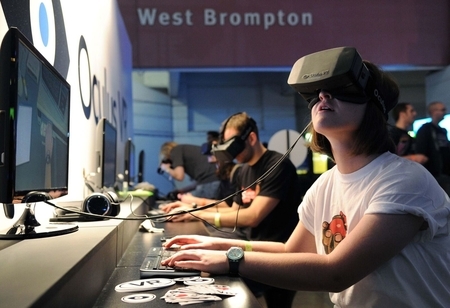 •Oculus Rift’s Quill – Quill is a tool to create VR technology that works with Oculus Rift. It is touted as a bit more on the design/artistic side. •Amazon Sumerian – Anyone can get involved with Amazon Sumerian, similar to Snapchat Lens Studio and Facebook AR Studio, and use it to create AR/VR/3D content. However, it is a bit more complicated than the above, and therefore may be a little more challenging technically for a novice user. Let’s see how the future turns out for this technology on the way to its maturity !